If you are Patricia Altschul, the Lisa Vanderpump of Southern Charm (according to Twitter), everything you do has to be fabulous. If you’re going to throw a party, let it be a flamingo party, and if you’re going to get another pet, get a hedgehog, and if you’re going to go to someone else’s party, bring your butler. And if you’re going to exclude someone, make sure you malign them as much as possible, and make sure you don’t conceal your feelings from anyone you know. And definitely don’t discourage anyone else from thinking the same thing you do. On Monday’s new episode of Southern Charm, parties were thrown, food was prepared by the least likely of chefs and Kathryn wondered yet again why people who were supposed to be her friends were excluding her from said parties. If you didn’t see the first two seasons of Southern Charm, you might not know that Kathryn used to hang out with these people before she and Thomas were involved (or, at least, editing made it look that way). On last week’s episode, Kathryn went to a party thrown by Craig and almost no one spoke to her, but they made sure to crowd around her and Thomas when they tensely discussed Kathryn’s pregnancy and the color of their daughter’s nursery. 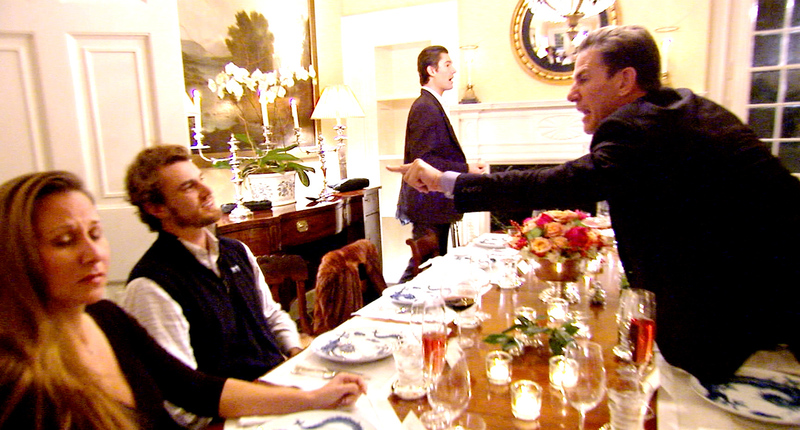 This week, when Cameran threw a dinner party, she didn’t invite Kathryn, claiming she didn’t want drama. We’ve barely started this season and I’m already so mad at so many people. Kathryn seemed genuinely confounded that people were leaving her out, and although she’s definitely made some scenes over the last two seasons, her exclusion wreaks of sexism, which of course no one’s talking about. She didn’t get herself pregnant, people. What do you know that the viewers don’t? We’ve seen some pretty awful fights on this show that have nothing to do with Kathryn. Last season, Patricia threw a dinner party that was just her and the male cast, and it ended in a huge, ugly argument between Whitney and Thomas. This whole thing where the cast is convinced that everything will be fine if they leave Kathryn out because Kathryn is crazy and can’t control herself is just a gross mess. Since the beginning of this show, she’s been a target because of her age and her involvement with Thomas, who, by the way, is a total disaster in his own right and acts like inciting drama with Kathryn is his full-time job. (I mean, he’s on this show, so I guess it is, but you get the point.) It’s sad to see everyone, except Craig, dismissing Kathryn. The herd mentality doesn’t look good on you, people.